Family Production started as a loose assembly of programmers and designers, only opening office almost two years later in July 1994, with registration as a corporate business following in March the next year1. 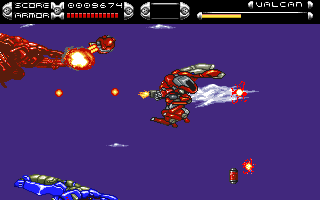 The company was one of the first Korean developers to bring its titles to overseas markets. 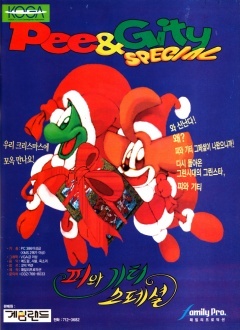 At first this was limited to Taiwan, but soon expanded towards the US and Europe, where three titles were published2. 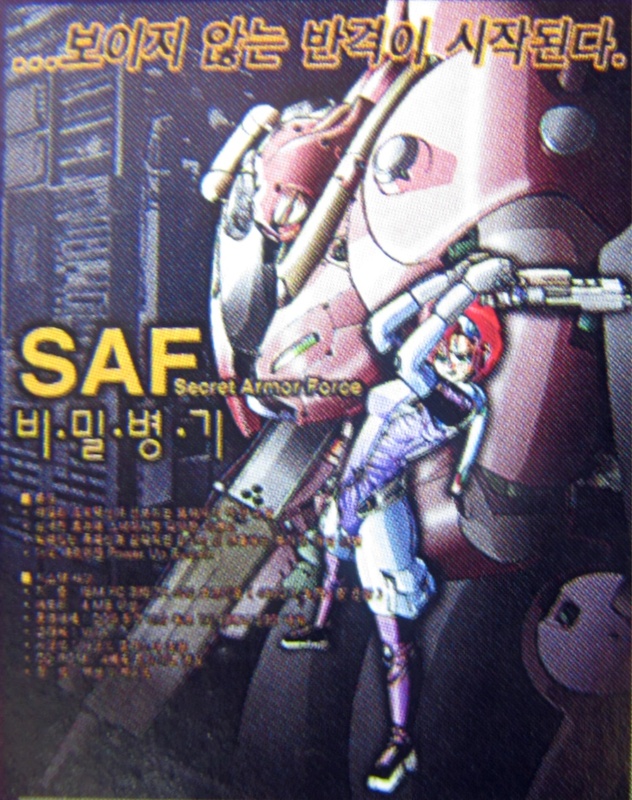 In Korea, Family Production soon stood as one of the main representatives for the home industry, next to companies like Mirinae Software and Softmax. 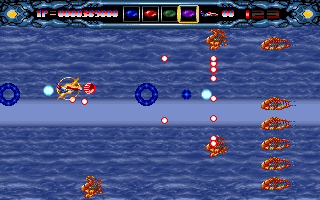 In later years the company shifted its focus towards arcade games through a partnership with the new PCB manufacturer and developer dgPix3. In 1999, it was acquired by Amuse World (then AM Tech) to work on the EZ2DJ series, first as RnD 5, later as the subsidiary firm Family Works. 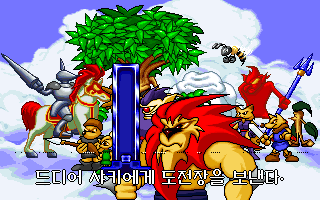 With their new won semi-independence, Family Works tried to establish the casual online gaming portal Netcade, but it never officially opened after two very short closed beta tests. 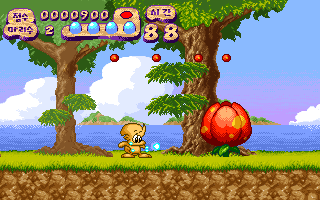 Team members later appeared working on games for another web game portal, the Gravity subsidiary Roplenet4, where the Family Works developed Wonder Rush also appeared. 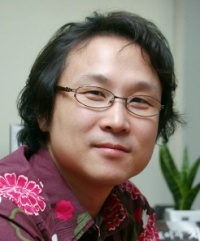 The team was disassembled in 20035, but immediately reformed as Pentavision, sticking with their more recent specialization in rhythm games by creating the DJMax series. 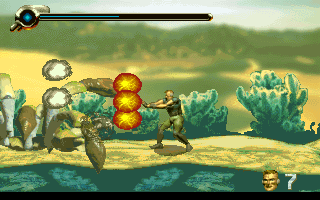 Pentavision has been bought by Neowiz in 20066, but kept operating as an independent subsidiary until 2012, when it was integrated as Pentavision Studio in Neowiz Mobile7. 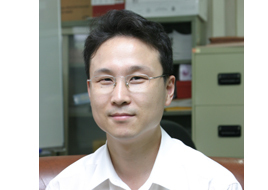 Subsequently, Shin Bonggun and Yi Jeongheon, Family Production veterans of the first hour, left the team to co-found the smart phone game developer PNix Games with former Neowiz employee Kim Jeonghun8. For the freshman work of one of Korea's most popular developers of the 1990's, Boksu Mujeong is surprisingly obscure. 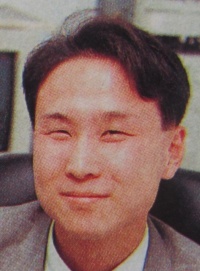 This is partly due to the fact that even Family Production didn't treat the game very well. 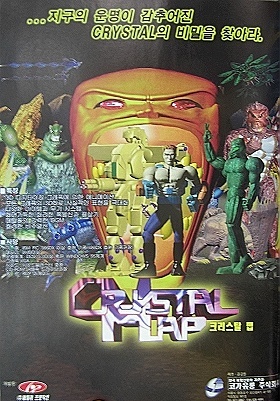 It was their only title not included in a 1997 compilation of their works until then. 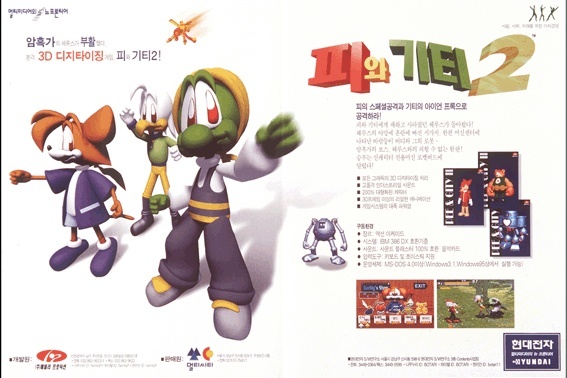 But since Family Production the company still didn't exist when it was released, the rights for the game might have been with SKC. 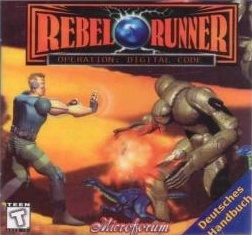 Only 2,000 copies of the game were sold9. 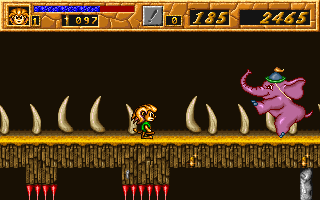 The futuristic action platformer was very obviously inspired by Prince of Persia, and uses similarly wonky controls. 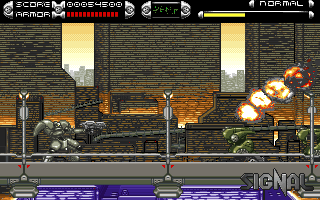 The hero wields a gun with limited ammunition, though, and can climb up and down poles. 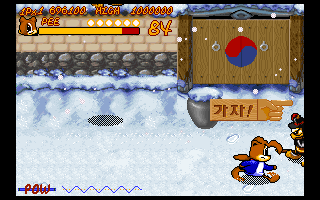 Like Mirinae, Family production produced a lot of simple games for KBS 2TV broadcasts, as well as a few downloadable via BBS. 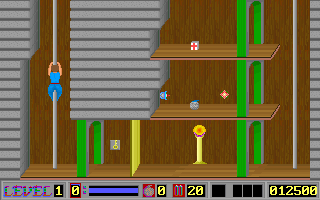 Most of these games were contract works for the "e-business" company Incom I&C. 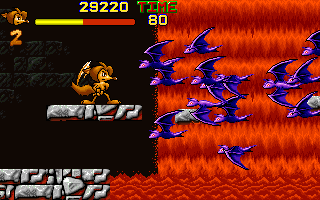 The beginning made Dino / Jigu Guchul Jakjeon (March 1994), a single screen action platformer were dinosaurs are fried with a flamethrower. 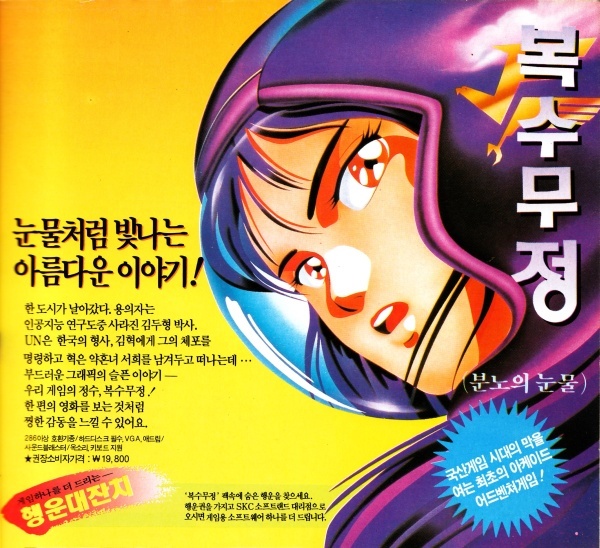 Keureta-seom-eui Yeongung / A Hero in Crete (June 1994) was an almost roguelike dungeon crawler, Reon-ui Moheom / Reon's Adventure (December 1994) a fusion of Sonic the Hedgehog with Euro Amiga flair. 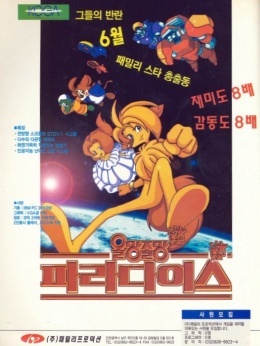 In 1995 followed Geuphada! Geuphae! / Hurry Up! and 4-mok / Connect Four. 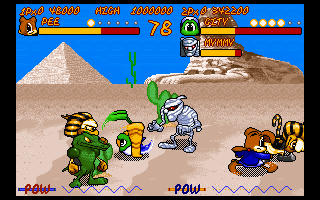 Most of these titles were also later available on Family Production's home page, along with demo versions of some retail games10. 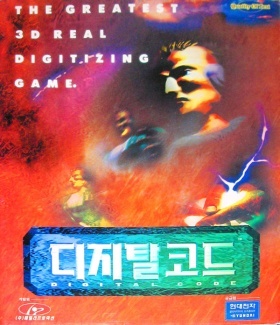 This is the game that helped Family Production establish itself as one of the new major players in Korean game development, selling 11,000 copies11, a huge success for a Korean game at the time. 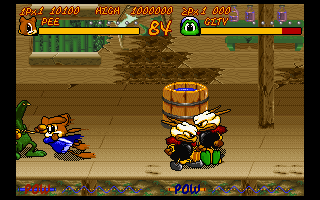 It may not look like it with all the cute anthropomorphic animals (and cakes), but Pee & Gity is a traditional beat 'em up like Final Fight or Streets of Rage. 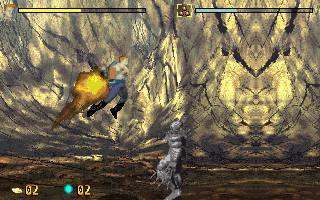 Other than most in the genre, though, it's not a belt scroller per se. 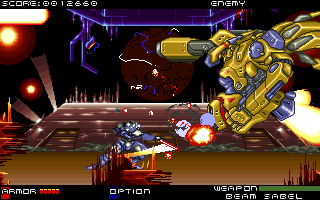 Instead the stages, which are never bigger than two screen sizes, are scrolling left and right freely while enemies attack from all sides. 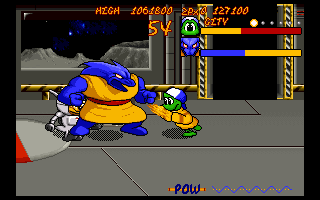 Otherwise it's mostly standard brawler fare. 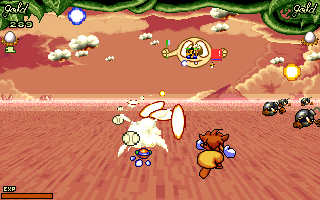 The only other innovation are the collectible power orbs, which can be used to execute the typical desparation attack without the energy loss that's usually associated with it. 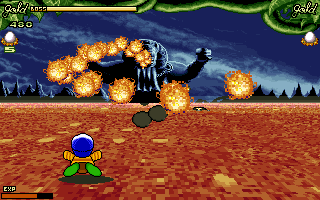 If one of the heroes waits until he fills all six slots for the orbs, he can transform into a mecha-ish creature for the rest of the stage (unless he loses all his energy, that is). 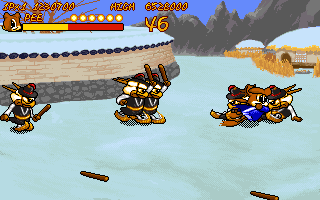 Those pack quite a punch and would be invincible if it weren't for the fact that their hit boxes don't match at all with their sprites on screen and their inability to pick up items. 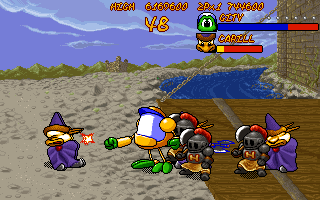 There are health refills and score items, as well as a number of weapons like frying pans, staffs and stones, but they all amount to the same throwing attack. 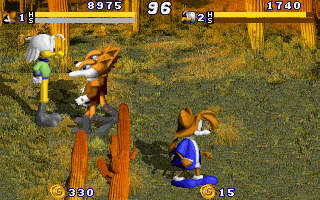 The stage count is high for a brawler, but since they're all so incredibly short, skilled players can beat it just as quickly as the first Final Fight, if not faster. If there's one game in the Family Production catalogue that can be clearly accused of plagiarism, it's Illusion Blaze. 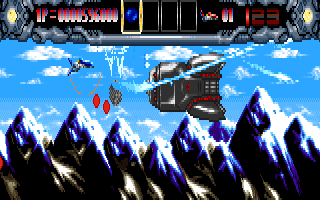 The level select between the first four levels and the weapon system with four seperately selectable and upgradeable weapons are courtesy of Thunder Force IV, and even the music tries to imitate the acoustic ferocity of TechnoSoft's series, although with mixed results. Some tunes hold up perfectly, while others are just meh. 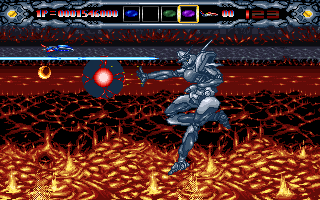 Further the designers stole the Force from R-Type, complete with shooting and retracting mechanics, and some backgrounds almost look like copy&paste jobs from famous genre references like Last Resort. 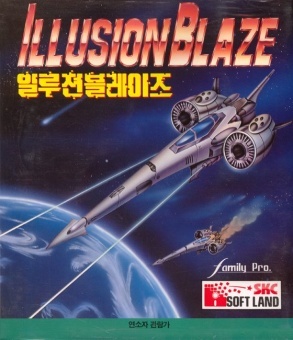 Well, sometimes it's better to take from the best than trying to invent the wheel anew, and Illusion Blaze does a competent job to fit all those elements into an entertaining and challenging melange. 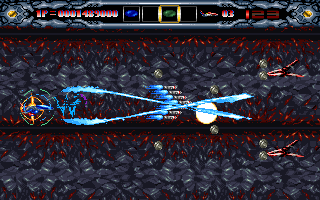 After a tame first stage, the difficulty goes up rapidly, and stages become huge deathtraps. 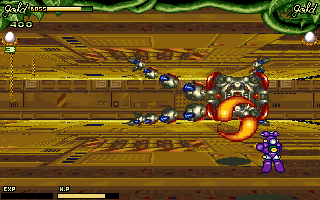 Unfortunately, many bosses suffer from the Korean shmup boss syndrome (meaning it takes forever to shoot them down), others are designed with stupid blind spots that make them a breeze. The technical execution leaves little to be desired, either. 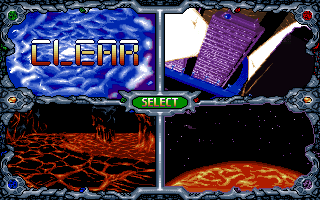 Stunning use of palette rotation, dozens of explosions and other special effects make it easy to overlook the DOS-typical lack of transparencies and the not 100% smooth scrolling. 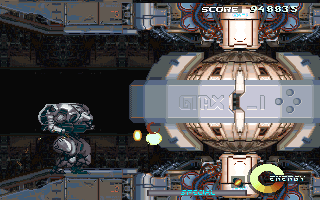 For some reason the screen mode (like in Pee & Gity) can be switched to double the vertical pixels, resulting in a stretched image that only shows a smaller area. 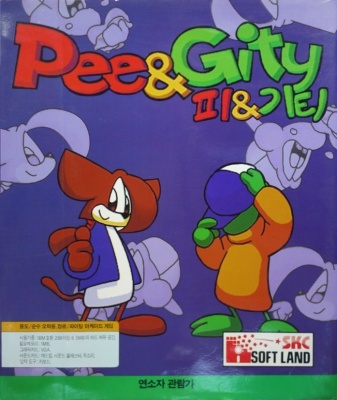 Pee & Gity Special is kind of a remix of Family Production's hit game. 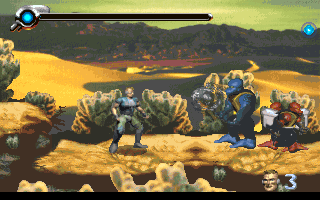 With very few exception, all the sprites are recycled from the former game, but the stages are new, this time following the good old belt scrolling trope. 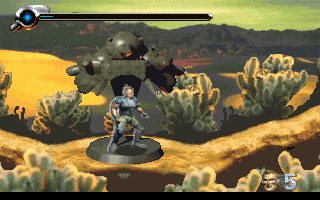 This proves the more feasible approach, as progressing the stages is much more fun and it plainly feels more like a "true" brawler. The update also brought with it a couple of new problems, though. 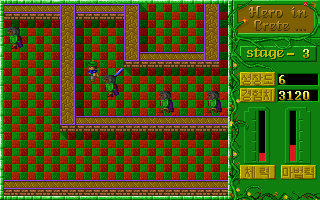 The "improved" AI brings cowardly enemies that spend most of their time outside of the screen shooting at the players, until lured back with constant zig-zag motions. 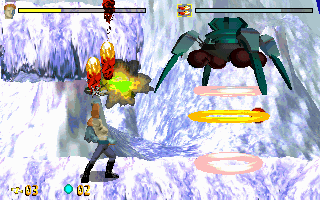 Some bosses also could get stuck in an invincible loop, leaving no choice but to give up or use up all lives and credits left. 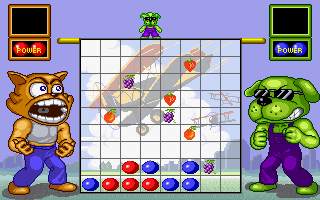 Interrupt is almost three different games in one. 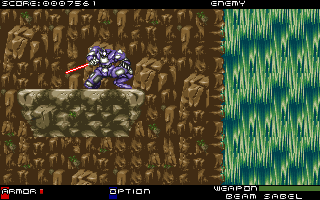 There's two mechas to chose from, the "RG-104 Cyber-Troll" is obviously inspired by Cybernator with its trademark heavyweight feel, several weapon systems and jetpacks, whereas the lightsaber-wielding "SG-43 Ripple" controls just like the protagonist in a standard sidescrolling action platformer. 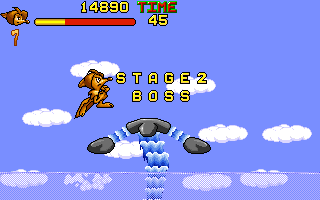 Finally, most stages contain a flying sequence. 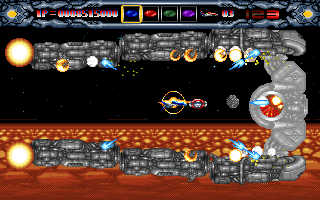 These are self-scrolling and play just like a horizontal shmup, with the exception that there's a seperate fire button for left and right, respectively. 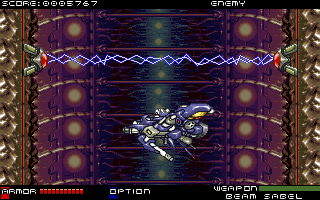 The controls in all three modes are very tight, but the hit detection seems not always coherent. 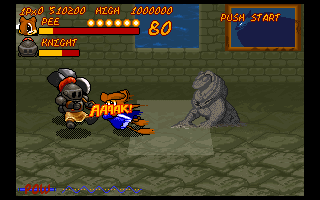 For that reason it's sometimes more difficult to avoid getting hit than it should be. 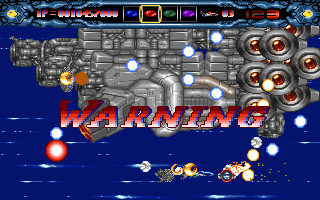 The huge sprites, while looking gorgeous, worsen the issue, and at a high speed it's almost impossible to anticipate incoming danger before it's too late. 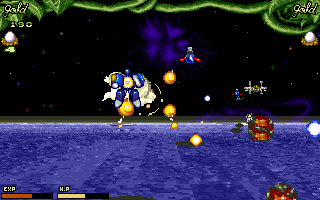 This is especially true for the shoot 'em up passages, where the characters almost fill a perceived quarter of the screen. There are no checkpoints during the rather long stages, making failure all the more frustrating. 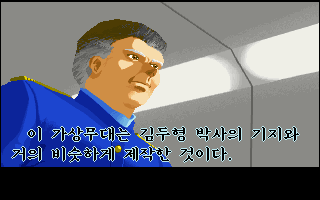 With the release of Illusion Blaze, Family Production provided preview screenshots for the then upcoming title, tentatively dubbed Signal. 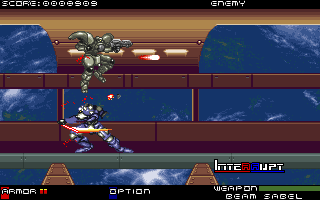 These shots showed one of the later enemies as the assumed player character, and suggested seamless transition between some substages where the screen fades out and reloads in the final version. 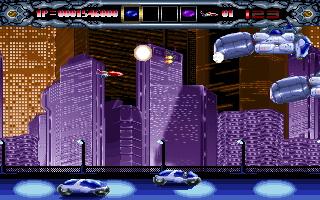 Interrupt was the first of three Family Production titles that made it to the US and Europe thanks to a publishing deal with Microforum International, here with the titel Iron Blood. Family Production brought in turn Microforum's Maabus to Korea. 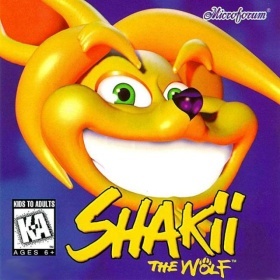 A bad day for Shakii the Wolf - once king of the wonderful kindom Shake, he was defeated and almost killed by an usurper, the evil lion Midnight Sword. 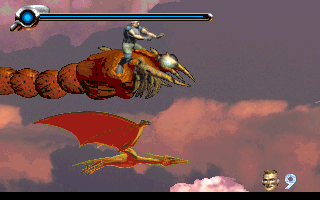 But of course he survives and goes on a quest to seize his rightful throne again. 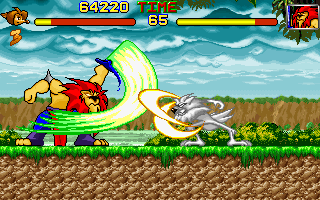 What almost sounds like the lion King also doesn't look too far from the video game adaption to the Disney movie, although the animals here are anthropomorphic and Midnight Sword is supported by a bunch of ghosts and trolls. 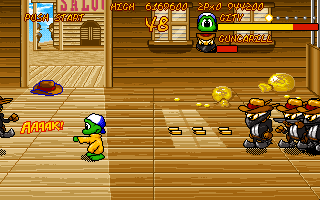 The genre of choice is an action platformer with borderline brawler tendencies, as Shakii prefers to solve problems with his fists and commands a number of special moves. 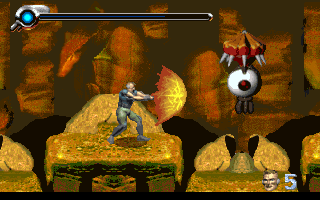 To win back his throne Shakii has to make his way through seven stages, each protected by a sub- and final boss. 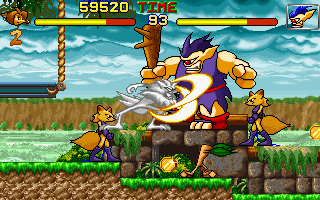 When fighting his doppelganger in the second-to-last stage, Shakii turns into a super wolf with a different moveset. 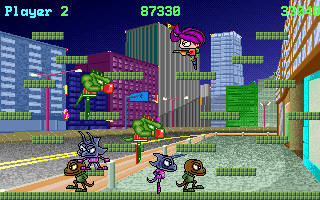 The game looks adorable and kiddie-friendly, although Shakii comes off as rather agressive and the game is quite difficult, with especially challenging boss fights. 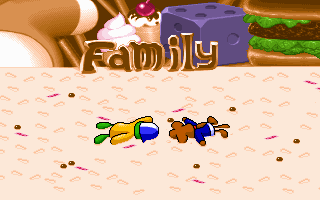 Sadly, the game suffers even more from inaccurate hit detection than other Family Production games. 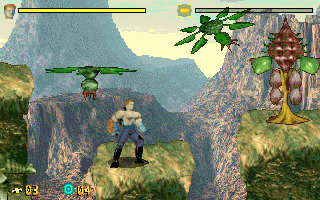 Shakii was also released in the West through Microforum international. 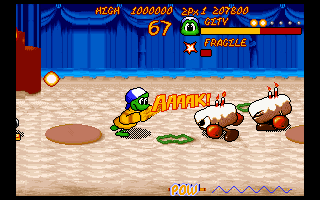 FP's all star game unites all the iconic heroes of their former games. 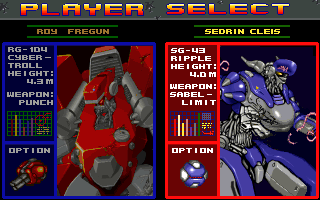 Shakii and his wife are selectable just as Pee & Gity, so are the mechas from Interrupt. 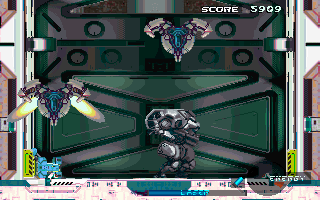 Even the ships from Illusion Blade kinda returned in a Twinbee-fied fashion. 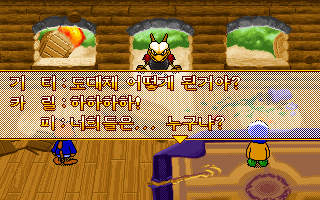 Only Boksu Mujeong gets the shaft as usual. When thinking about what common features could unify all these characters in one game, one of the last things that would come to mind is a fake 3D shooter a la Space Harrier, but here it is. 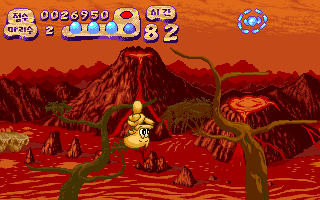 Similar to Sega's later games in the genre, Olmang Jolmang Paradise does all it can to make the formula more interesting. 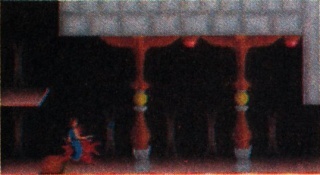 Moving walls and ceilings or background elements that turn into huge bosses are only a few of the surprises the game has in store. 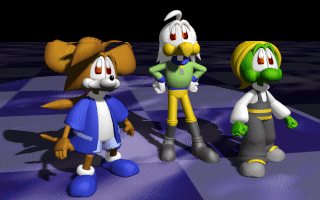 Each pair of characters has their own starting stage, but everyone goes through the same set during the course of the game, it's only the order that changes. 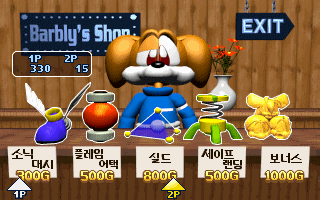 Pickups are limited to several kinds of coins, which can be used in the shops hidden inside each stage. 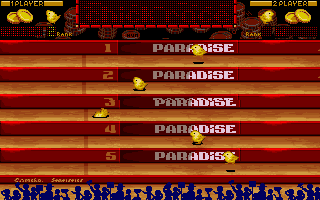 Here all the other extras like extra lives, "Option" sidekicks and betting tickets to a chicken race are bought. 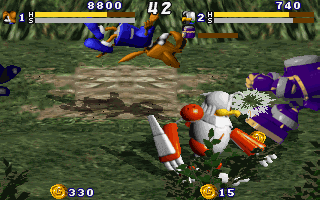 All could be nice and dandy with the game, but of course there are the usual drawbacks. 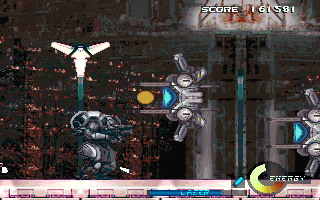 Hit boxes are up to twice as big as the sprites they're associated with. Together with the inevitable z-axis inaccuracy typical for the genre this makes surviving about as heavily based on luck as the chicken race. 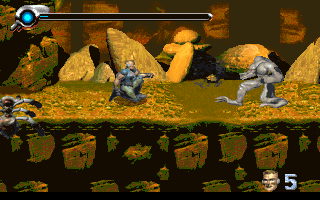 The music, while excellent as ever, also leaves a bad aftertaste, as most of it is recycled from previous games. Eol! 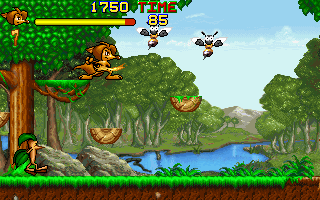 is without a doubt the best of Family Production's platformers. There's many reasons for that, but on the forefront stand the reliable controls and the reasonable difficulty curve. 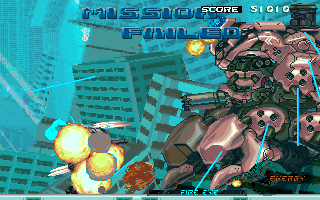 No weird hit detection errors, no unfair 2nd stage boss or the like. 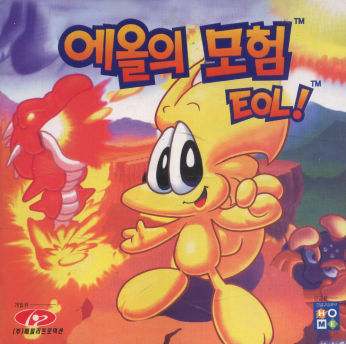 Eol himself is perfectly adorable and it should be funny that he missed starring in Olmang Jolmang Paradise, as he became the most iconic of the Family Production heroes. 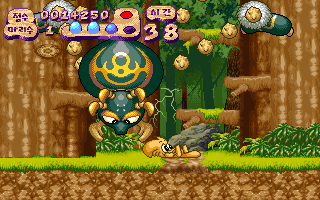 While the game mostly offers standard platforming fare, there are a couple of nice ideas, so Eol uses his tail to grab onto poles and trees. 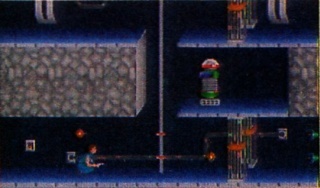 Similar to Mega Man in the later episodes, he can also slide on the ground to evade attacks or get through narrow passages. 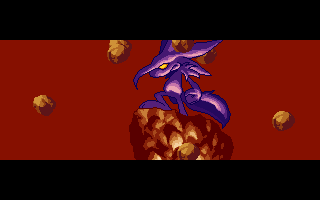 For once the game offers challenging boss fights that go beyond the "find a save spot / dominant attack pattern and repeat it again and again" still found in Shakii. 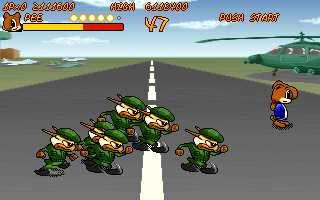 Most of them require a suitable strategy as well as moderate skill to beat. 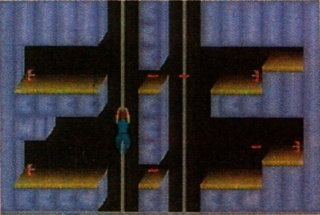 Stage design overall is above par, but not without annoying segments. 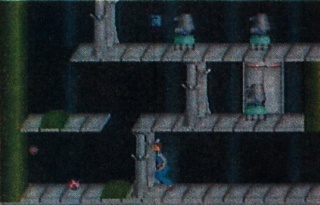 The designers also couldn't refrain themselves from including a terrible minecart stage. Still, Eol! 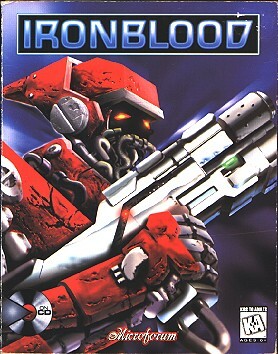 is a great game despite its few weak points. As if to mock players, Mircoforum didn't bring it overseas, though, opting instead for the much more flawed Digital Code. At first, Digital Code seems like an unfair mess of a game. 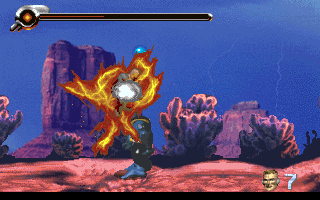 Any enemy hit kills instantly, the only attack seems to be a firy punch, and some enemies take as long to kill as the bosses in other games. 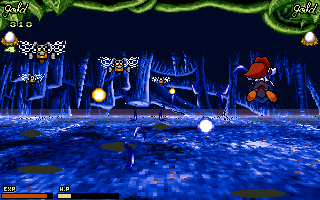 Blue orbs that are lying around all over the stage fill a bar for ranged attacks, but it emties just as fast as it is filled. 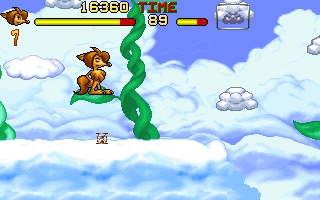 It all comes together only after one learns the proper use of the double jump. 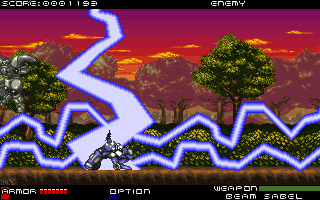 Spinning around, the hero creates a field of lightning around himself, which is the only way to kill enemies without depleting the energy bar. 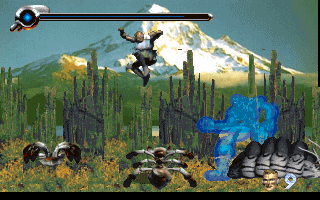 Now it turns out that it can be charged in five levels, which not only enhance size and power of the projectiles, but also serve as a health bar, making it much easier to survive. When knowing how to properly play the game, it isn't so bad after all. 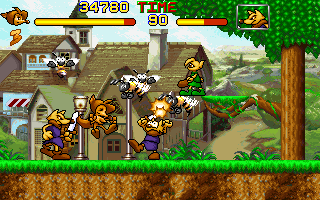 Things get hectic easily, though, especially since the double jump is fast and hard to control. 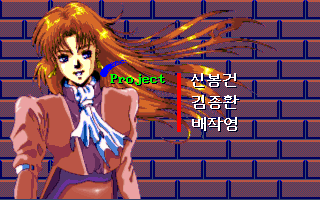 The camera is set to always move forward so that the protagonist has two thirds of the screen in fron of him. It is nice to see what lies before, but when turning around frequently, seasickness is almost guaranteed. 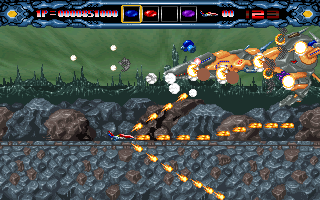 The speed of the game can be de- and increased via hotkeys, but in practice this means the choice between tedious slow motion and chaos. 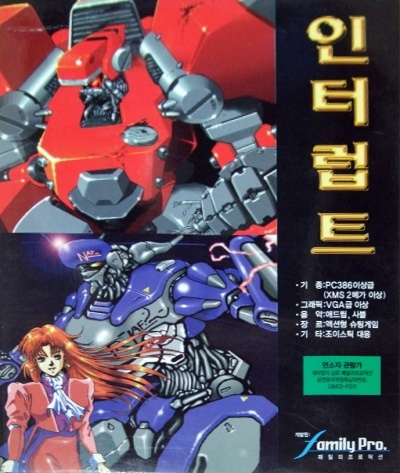 Donkey Kong Country and Rise of the Robots left their mark also in Korea, as the dominant trend towards prerendered graphics in the second half of the decade attests. 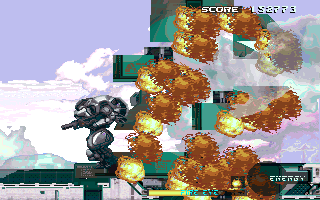 Digital Code is one of the few examples where it actually looks befitting, although noticeably low-end. 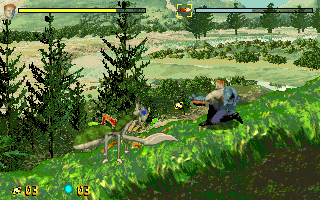 The game could have used a bit more graphical variety, though. 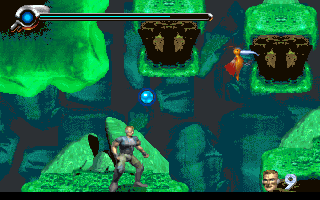 The first ten or so stages offer little less than iterations of the same two tilesets in different color pallettes. 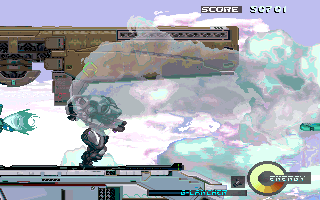 Soon after that follows a stage whose layout is messed up, which randers it unfinishable. 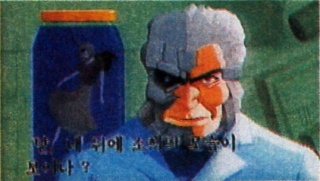 The only direct numbered sequel Family Production ever produced uses prerendered sprites like Digital Code. 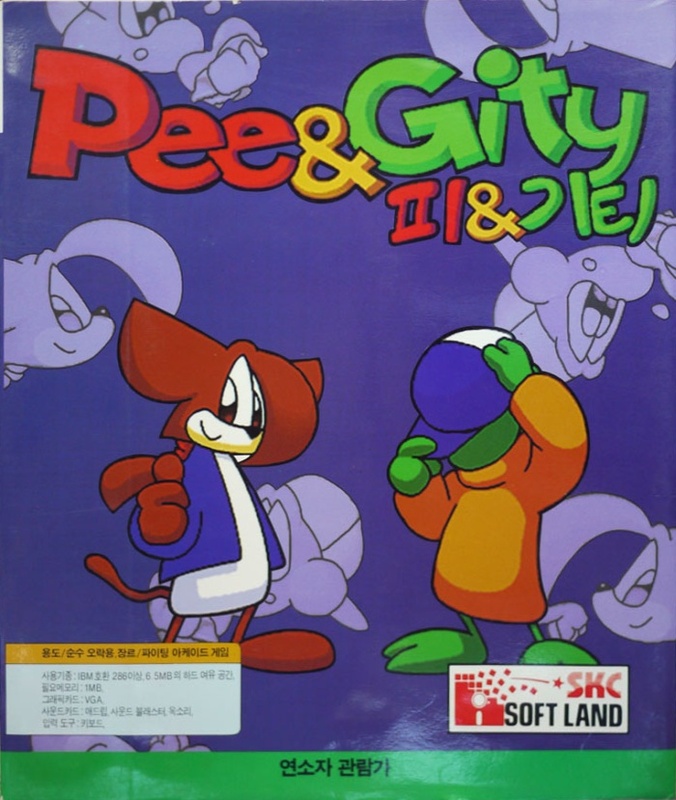 Py & Gity 2 looks especially hideous, though, completely throwing away the cartoon charme of the first 1 1/2 games in the series. 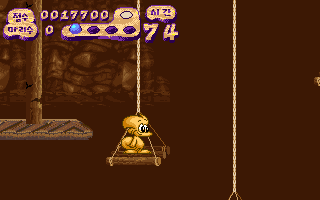 Added elements are an item shop and a new friend of the two animals, a bird who remotely resembles Gyro Gearloose. As a rather export-strong company, FP apparently noticed that a character named "Pee" would be rather awkward on English speaking markets, which explains the new spelling of the title. 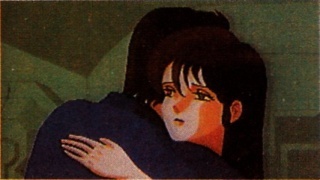 Nonetheless, Py & Gity 2 was never released in the West. Py & Gity 2 won the first official Korean Game of the Year award in 1996. 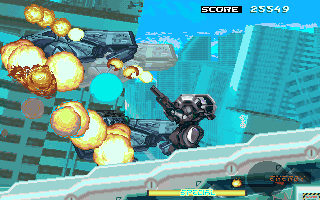 Quasi-sequel to Digital Code, although with a more typical run 'n gun-concept. 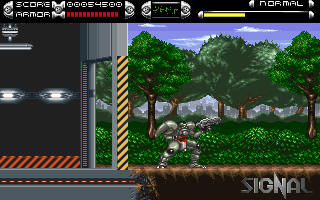 Family Productions last side-scroller released in the final days of DOS gaming, SAF: Secret Armored Force gets rid of all the technical issues from which former games by the company suffered. 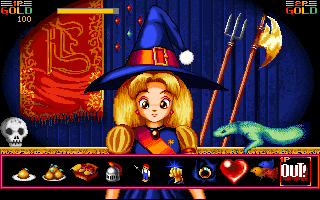 Even the scrolling runs perfectly smooth, and there are real transparency effects, which are not too common with DOS games overall. 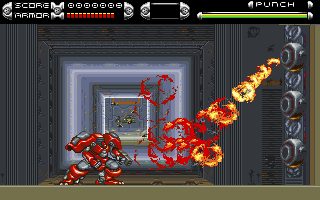 Although not a sequel per se, the game soon evokes memories of lazenca, not only because the player once again takes place in a mecha. 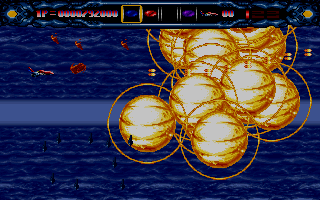 Instead of having to chose between two models, though, the machine in SAF unites the agility of the Ripple with the weapons and jetpacks of the Cyber-Troll and for good measure throws in the left & right fire buttons of the shmup sequences in lazenca. 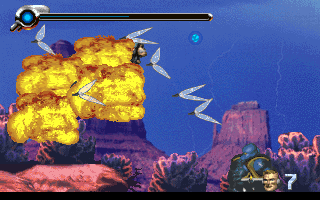 Weapons can be upgraded in two levels, and filling the upgrade meter above that unleashes a devastating special attack particular to that weapon. 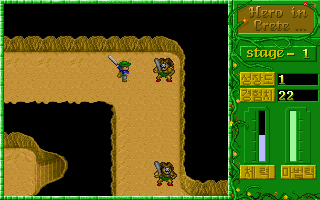 During the first four stages weapons get gradually unlocked. 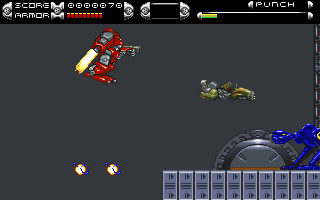 After the initial machine gun follow a frame thrower, a grenade launcher and a laser cannon. 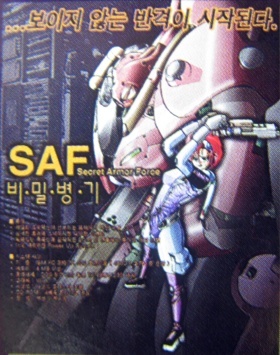 Unfortunately, SAF is one of those games spoiled by a completely impossible difficulty level. 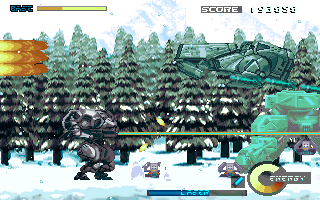 The mecha is so big that it gets hit all the time, but astonishingly fragile for such a huge hunk of metal. 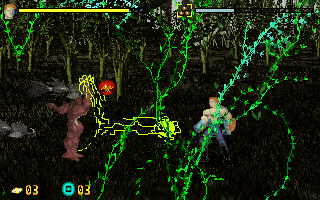 Some of the standard enemies even take more hits. 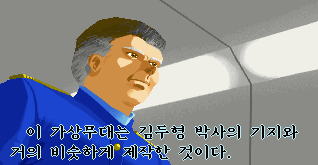 There are no checkpoints at all, either, no matter if a stage is fifteen minutes long. 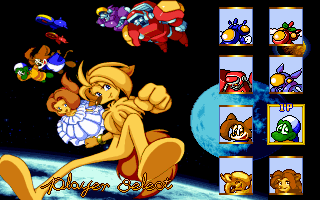 Worst of all, though, all one has to work with are two pathetic credits to continue, there's no saving, no password system, just starting over from the first stage again and again.